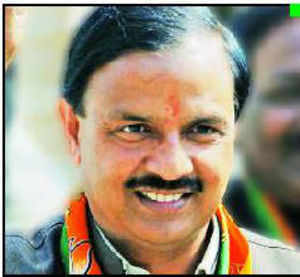 NOIDA: Talk of an international airport in Greater Noida has resurfaced with newly appointed junior minister in the civil aviation ministry and MP from GautamBudhNagar, Mahesh Sharma, saying he will explore the possibility of setting up the project. Sharma, who will take charge on Wednesday, said he would discuss the issue with the UP government and expects the proposal to be finalized within a month. “Prime Minister Narendra Modi is keen to develop world-class infrastructure in the country, which will help generate jobs,” Sharma told TOI in an interview after he was named minister of state for civil aviation, tourism and culture. “I guess within a month, a proposal will be finalized and discussed at a higher level,” he said, but did not elaborate. Sharma, a doctor and owner of a chain of hospitals in the Noida-Greater Noida area, said development of the region had suffered due to the poor law and order situation and faulty policies of the state government. An airport would help the area emerge as an industrial hub, he added. “Strategically, Noida and Greater Noida have great potential to generate more jobs in north India, especially in western UP. There is a need to develop an airport in this belt,” he said. Noida has got a minister in the Union cabinet after nearly 10 years. The idea of an international airport in the region is not new. In 2001, then UP chief minister Rajnath Singh had proposed an airport in Greater Noida. Later, the Mayawati-led BSP government also attempted to get approval for the project in Jewar, near Greater Noida. But the AkhileshYadav government scrapped the project, citing a clause that bars development of a second airport close to an existing one. This move was considered a major blow for local industries and hurt development in the region. In a damage control move, the Greater Noida Authority has proposed a heliport project but this too has suffered from government apathy. Existing rules do not allow a second airport within a 150-km radius of an existing one, unless the latter is operating to capacity and is unable to meet the city’s demand. That is why Navi Mumbai, a suburb of the financial capital Mumbai, is getting an airport. The issue of Noida getting an airport at Jewar was last raised about seven years ago when Mayawati became the CM of UP. On her first trip to Delhi to meet then PM Manmohan Singh, she had raised this demand. The PM had agreed to look into her request. In Delhi’s case, the expansion plans for IGI Airport are such that they will meet the capital’s requirement till the late 2020s. The GMR Group is opposed to the idea of another airport for Delhi as it says that would render both the airports economically unviable. Because of these reasons, the Jewar airport project did not take off. Moreover, Delhi International Airport Private Ltd (DIAL), which manages IGIA, enjoys the right to veto any second airport that conflicts with the mandatory 150km stipulation. The UP government had acquired 2,471 acres of land, spread across 35 villages for the airport project in 2003. The Yamuna Expressway Authority has planned to develop industries on some portions of land acquired for the airport in Jewar. The remaining land has been left vacant for development plans for the future. “An international airport in this belt will definitely help the economy in the area, and help attract foreign investors. With the latest developments it appears that things will improve and the region will become a hub for industries,” said Aditya Ghildiyal, president, AGNI (Association of Greater Noida Industries). Airdrop will work between two ios devices and potentially between an ios device cell phone sms spy free and a mac. A junior minister normally does not interest the media much, but Mahesh Sharma stirred up a hornet’s nest on assuming office as minister of state for civil aviation last month. Among his first statements as minister was one where he said he would try to revive the plan for a second INTERNATIONAL AIRPORTin Uttar Pradesh at Jewar in Greater Noida. The project was conceived more than a decade ago in 2001 but had been caught in the political crossfire of governments from three different parties. Sharma, a member of Parliament from Gautambuddh Nagar, said discussions will be held with Prime Minister Narendra Modi to finalise the proposal. He cited infrastructural constraints in the national capital region for the renewed interest in the initiative. “Strategically, Noida and GREATER NOIDA have great industrial potential and, therefore, infrastructure would be needed. It would also generate jobs. Therefore, there is a need to develop an airport in this belt,” he said. “The new airport project in Jewar is an important project. It has to be discussed in the wider interest of the nation. The airport is not a project of Mayawati or Mulayam Singh, but of India.” The Jewar airport proposal was first mooted in 2001 by Rajnath Singh, who was then the chief minister. It was endorsed by his successor, Mayawati. However, the Akhilesh Yadav government withdrew the proposal citing a clause that bars the development of a second airport close to an existing one. The development of the airport in Greater Noida would benefit real estate developers who have been hit hard by the economic slowdown. There has been little activity and sales have been slow over the past two years. With inventory running mile-high, developers have been focusing on clearing the backlog instead of launching new projects. Inventory levels across India have been rising over the past two years. While an ideal market maintains an inventory of eight months, the Mumbai Metropolitan Region had an inventory of 53 months at the end of June 2014, while the National Capital Region had an inventory of 45 months, data by research firm Liases Foras showed. Hyderabad had an inventory of 47 months, Pune 23 months and Chennai 26 months. Bangalore had the smallest inventory among the major cities of 19 months. Given this situation, infrastructure creation in the form of a new airport would help correct realty prices in the belt. However, a second airport at Jewar goes against the existing policy. The distance between the proposed site and New Delhi’s Indira Gandhi International Airport, or IGIA, is less than 150 km. According to the current norms, “No greenfield airport will normally be allowed within an aerial distance of 150 kilometers of an existing airport. Where it is allowed as a second airport in the same city or close vicinity, the parameters for distribution of traffic between the two airports will be clearly spelt out.” The government can, however, approve a greenfield airport at places where an existing airport is unable to meet the projected requirements of traffic. It can be allowed both as a replacement for an existing airport or for simultaneous operation. 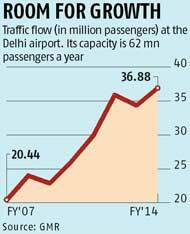 Dubey fears the development of a second airport in the national capital region would lead to higher user charges. “Creating a second airport in Delhi before IGIA gets saturated may render both airports unviable. User charges at both airports will rise since the operating cost and capital expenditure at both airports would be spread over the same flyer base. Airlines may not like to split operations at two nearby airports given the high fixed cost, unless of course they can’t add any further slots or cargo handling space at the older location,” he says. Highly-placed officials in the MINISTRY OF CIVIL AVIATION too are apprehensive about the project. “The state government has already scrapped the proposal, so how can we take it forward?” asks a senior official. Besides, there are contractual obligations that the government has towards Delhi International Airport Limited that operates IGIA. But Sharma argues otherwise. He says, “The population in Delhi-NCR is projected to increase to 2.45 million by 2030 from the current 1.6 million. The existing infrastructure would not be able to support such growth. There is a need to develop a second international airport, and Jewar is the closest place to Delhi that has land available for use.” Over 2,378 acres of land, spread across 35 villages, was acquired in 2003 for the airport in Hewar, which falls in Sharma’s constituency, and there is more land available if needed. Kapil Kaul, chief executive officer (South Asia), Centre for Asia Pacific Aviation (CAPA), is not entirely dismissive of the idea. “Land earmarked earlier for the Greater Noida airport should have been acquired for the second airport in the national capital region,” he says. “Land acquisition now will be costlier and could also face challenges. It will take 5-7 years, if fast tracked, for the second airport to become operational, the earliest possibly being 2021-22, by when IGIA will be closer to its structural capacity.” He adds that whether a second airport comes up or not by 2022, IGIA will remain competitive and a critical airport with a very strong network density. “India’s airport development plan lacks a long term focus. We need a structured master plan for airports that can last more than a generation (three to four decades) and is integrated to the overall national transport infrastructure plan,” says Kaul. The Jewar project, if sanctioned, could change the policy on greenfield airports at a time when the government is aiming at increasing air connectivity by developing budget airports in smaller cities. The government has said it will encourage the participation of the private sector in such projects to tap into resources as well as expertise. An institutional framework would be established for the same, while regulators would be given greater autonomy as well as accountability. Overall, infrastructure creation in the form of modernisation of existing airports and development of low-cost airports to promote air connectivity, particularly to remote and regional areas, is a major area of focus for the Modi-led government. After all, the issue was part of the Bharatiya Janata Party’s election manifesto, in which it spoke of the “potential for (developing) inland air transportation to various remote and local locations in the country. Such air strips will be developed so that low cost air travelling becomes possible within the country”. This is a very significant liability for prothesiswriter.com custom thesis writing our society. NEW DELHI: The civil aviation ministry is to offer the contract for building and running the proposed Jewar airport in Greater Noida to the GMR Group, which operates the one in Delhi, once the project gets the preliminary approvals that are required. The ministry is currenrly awaiting the Uttar Pradesh government’s written consent. “The population of the National Capital Region is about 50 million, which is going to increase further in the next four to five years. If we need a second airport in the region, we need to start planning now or it will be too late,” said a civil aviation ministry official who did not want to be identified. “We will offer the construction and development of the new airport in Jewar to the GMR Group, if they feel that the new airport will impact their revenues.” The official added that nothing on this plan has been shared with the PMO yet as the ministry is awaiting the Uttar Pradesh government’s assent. “The UP government has verbally communicated their approval and we are awaiting their written consent. Once that comes, we will form a committee in the ministry to work out the details and the proposal will be sent to all concerned, including the PMO,” said the official. The GMR Group has the right of first refusal (RoFR) for any airport that is built within a 150-km radius of the existing airport in Delhi. Under RoFR norms, the existing airport operator (GMR in this case) will be asked to match the lowest bid arrived at after the bidding process for the proposed Jewar airport. According to the rules, GMR’s bid will be accepted only if it is equal to or less than 10% of the bid offered by the lowest bidder. THE AIRPORT IN JEWAR WAS PROPOSED BY THE ERSTWHILE MAYAWATI-LED UTTAR PRADESH GOVERNMENT AND THE UNITED PROGRESSIVE ALLIANCE (UPA) GOVERNMENT HAD FORMED A GROUP OF MINISTERS (GOM) TO DECIDE ON THE ISSUE. The group also contended that conservative activists were putting pressure on the publishers to make such read here alterations.